I am a sucker when it comes to a good chocolate cupcake, I find there is something nostalgic about them, and this recipe does the trick! It really brings me back to my childhood when there would be a birthday party to go to every other weekend. I love this recipe for its simplicity, and since the cupcakes are not overly sweet, the fluffy vanilla icing on top ends up becoming the perfect sugary balance. I found the recipe on Sweetapolita, a baking blog that I can look at for days! Check out this amazing cake! Inspiring right? This weekend was a big one for us. We hosted a Super Bowl party at our place and went all out with the food. I think there will be leftovers for weeks! It was really the first time we entertained for that many people and it definitely won’t be the last. I was going to get all creative with the dessert, seeing so many great ideas on Pinterest that blew me away, but I decided to stick to simplicity with a swirled blue frosting to go with the team colours. The blue should have been darker, but nobody complained. I also added some red sprinkles on top at the last minute for the Patriot fans in the room. This is no healthy dessert like my last delicious recipe I posted here, I won’t lie, but I don’t mess around when it comes to nostalgia. And lets be honest, it was the Super Bowl and I wasn’t about to introduce some healthy dessert to a room full of hungry men. I decided to do a swirled icing on top so it was a little more interesting and I think it turned out pretty nicely despite my lack of piping skills, don’t you think? It’s definitely something I want to practice. 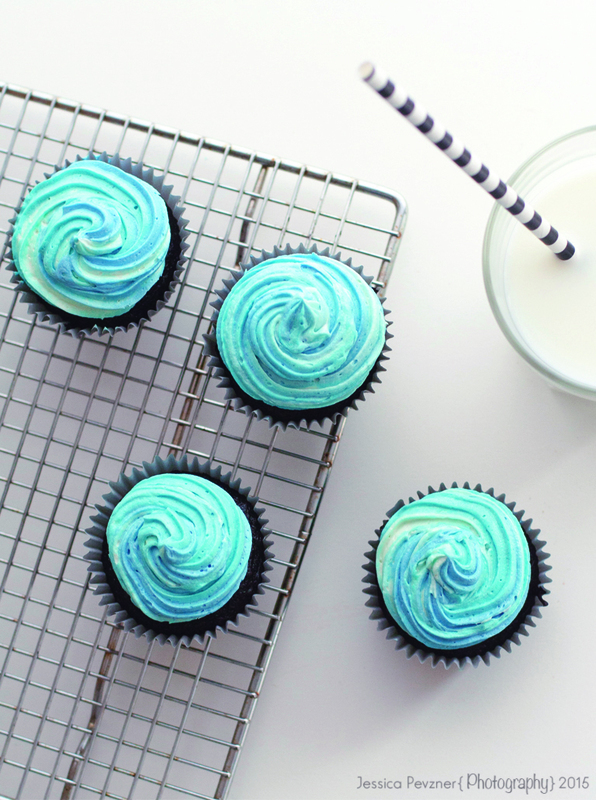 There are so many amazing things you can do with a piping bag! Next time I make these, i’ll use a wider tip so the three colours can be better defined and maybe add more icing per cupcake for height and drama. All in all I was really happy with the flavour and look of these little guys and I think everyone at the party was too. If you’ve been looking for a classic chocolate cupcake/frosting combo, this is one to bookmark. 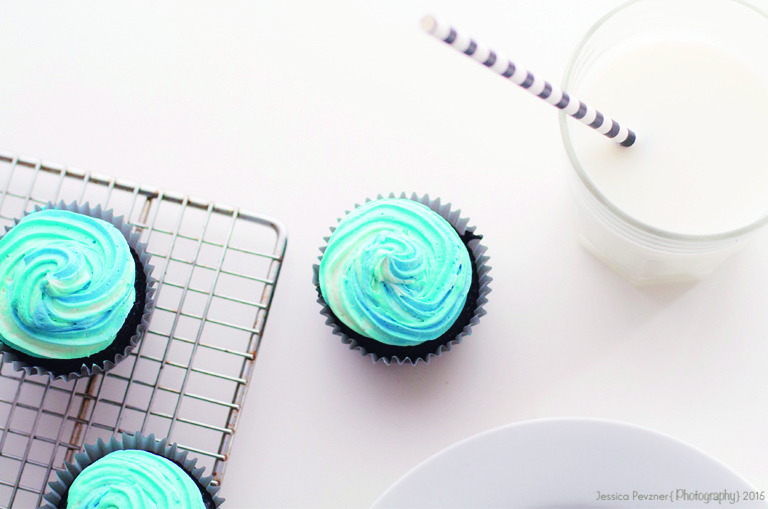 Whether you know someone with a birthday coming up or you are hosting a party like I did, or even just looking for an excuse to bake cupcakes (you can always find an excuse to bake cupcakes), you have to give this one a try! 3. 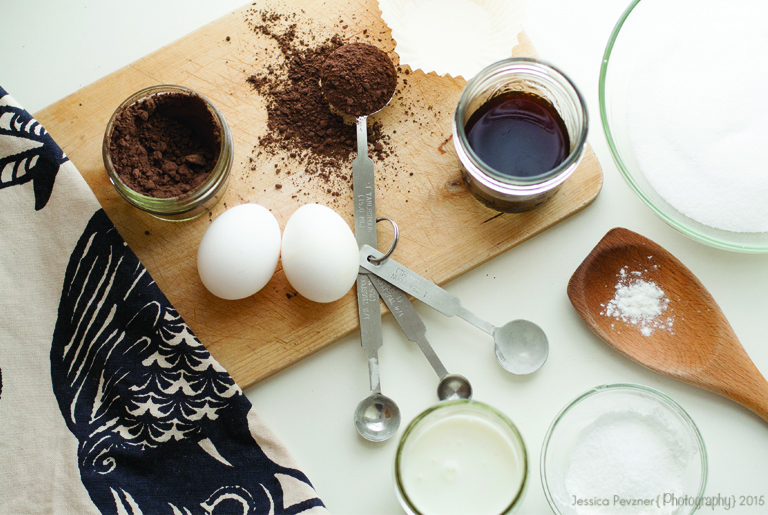 In a medium bowl, combine the buttermilk, coffee, oil, egg and vanilla. 4. Add the liquid mixture to the dry ingredients and mix them for 2 minutes on medium speed carefully because it tends to splash. Divide batter among (2/3 full or just less) liners. Batter will be liquidy, and cupcakes will rise. 5. Bake for 15-17 minutes, or until toothpick or skewer comes out with a few crumbs. 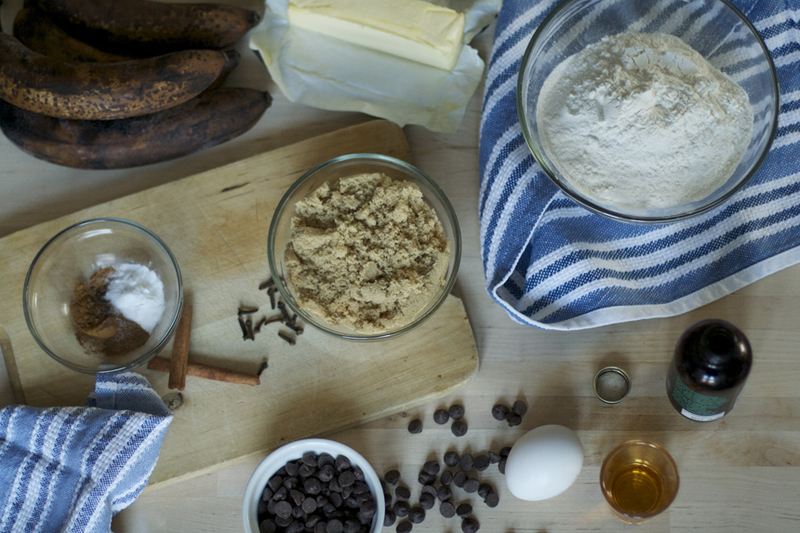 Try not to over-bake. Carefully remove cupcakes from the pan immediately (it’s hot! ), and place them on a wire rack until completely cool. 1. In a bowl of stand mixer fitted with paddle attachment, beat the butter on medium speed until very light and fluffy, about 6 minutes. Try not to eat too much of it in the process. 2. Add the confectioners’ sugar, milk, vanilla, and salt, and beat on low speed until well combined, then increase the speed to medium and beat until very light and fluffy once again, about 6 more minutes. 1. 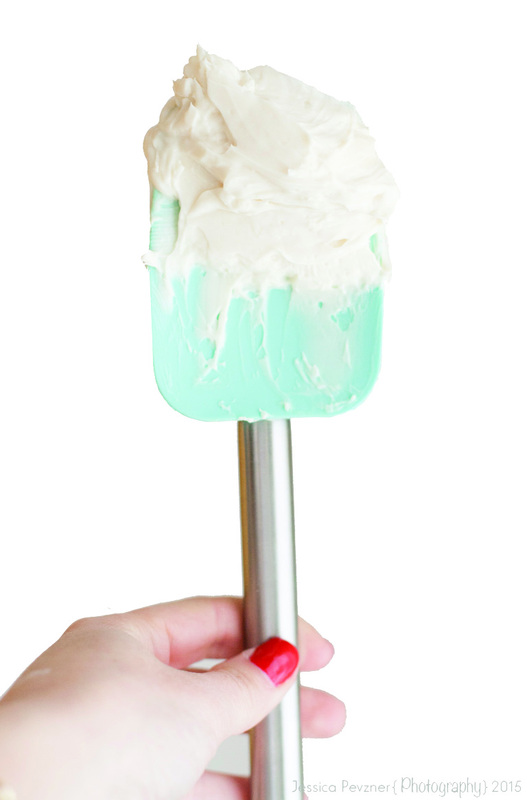 Divide the frosting into 3 parts. Tint 2 of them in shades of your choice and leave the last one white. 2. Into a medium or large pastry bag fitted with a large closed star tip, add a spatula-full of each frosting colour I used this tutorial to help me out. Twist the top of the bag and pipe a generous swirl on each cupcake, working in a circular motion from the outside in. 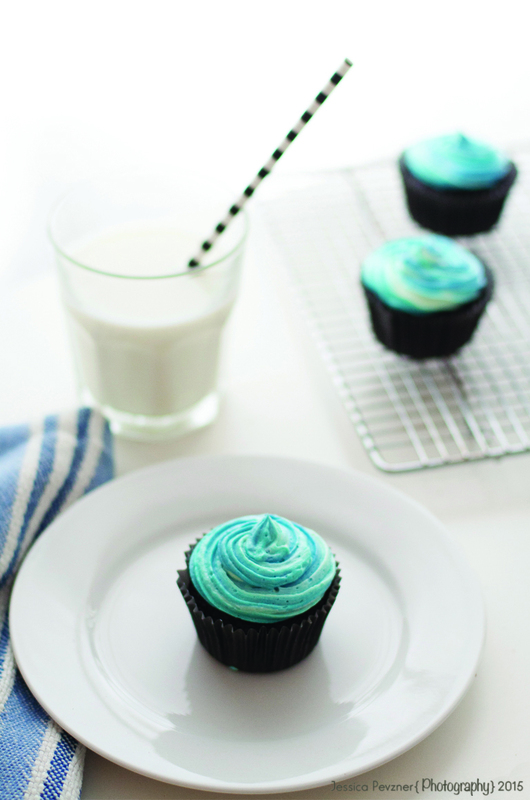 Note: The cupcakes will keep at room temperature in a container with some airflow for up to 3 days. Growing up, my mom held strict rules about what we had in our kitchen and junk food was limited. No yummy sugary cereals, cookies, soft drinks or TV dinners. I grew up on delicious home cooked meals, lots of salads and fruit. Of course I had junk food from time to time, my mom wasn’t that strict, but it was never really kept in the house. At the time, I didn’t understand how wonderful this was and how lucky I was, but I thank her now for instilling healthy habits in me from a young age. I now appreciate cooking and baking. I love bold flavours, spices, experimenting with new foods from different cultures, making things from scratch and sitting down for a good meal with family. At the time though, all I wanted was a bowl of delicious fruit loops, these Trixx yogurts with a pack of sprinkles you mixed in before eating, Michelina’s tortellini and broccoli frozen dinners, soda and Oreos! Anyways now that I’m all grown up I tend to steer away from packaged foods, sodas and junk foods. I do eat them on occasion, but I rarely keep them in the house. So when I saw this recipe I screeched! 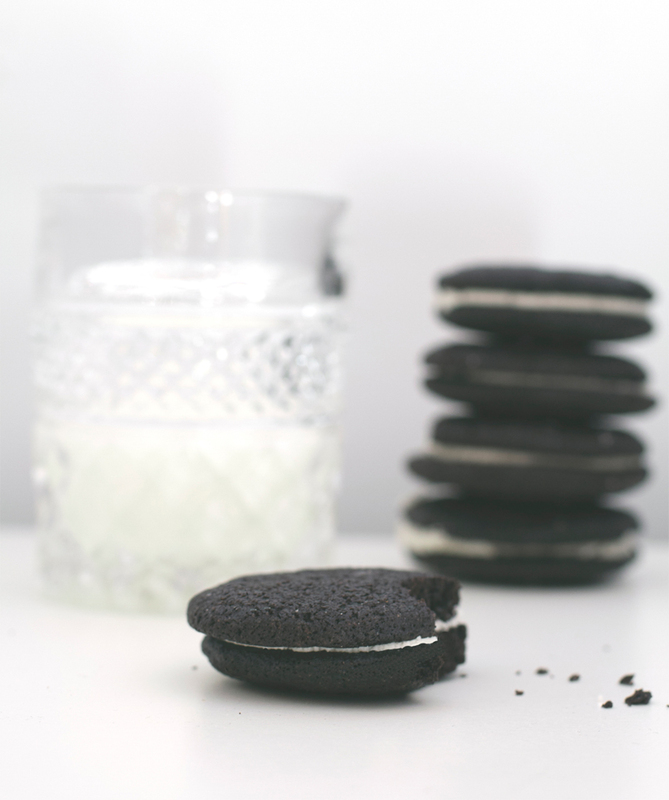 Homemade Oreos, it’s the best of both worlds! My boyfriend took a bite and was disappointed that it wasn’t soft and fluffy. 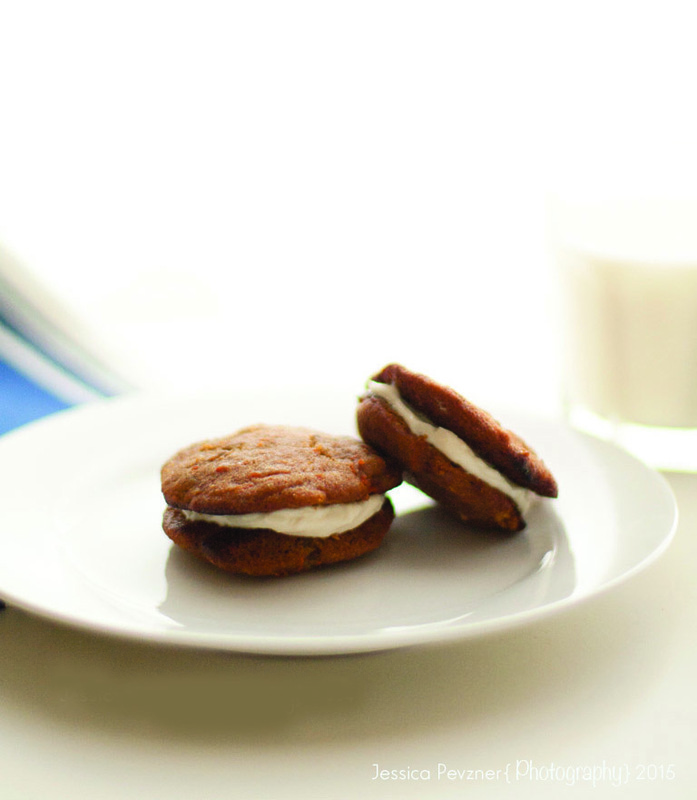 I guess he was expecting a whoopee pie from the way it looked (which is a great idea – Oreo whoopee pies? yum!) 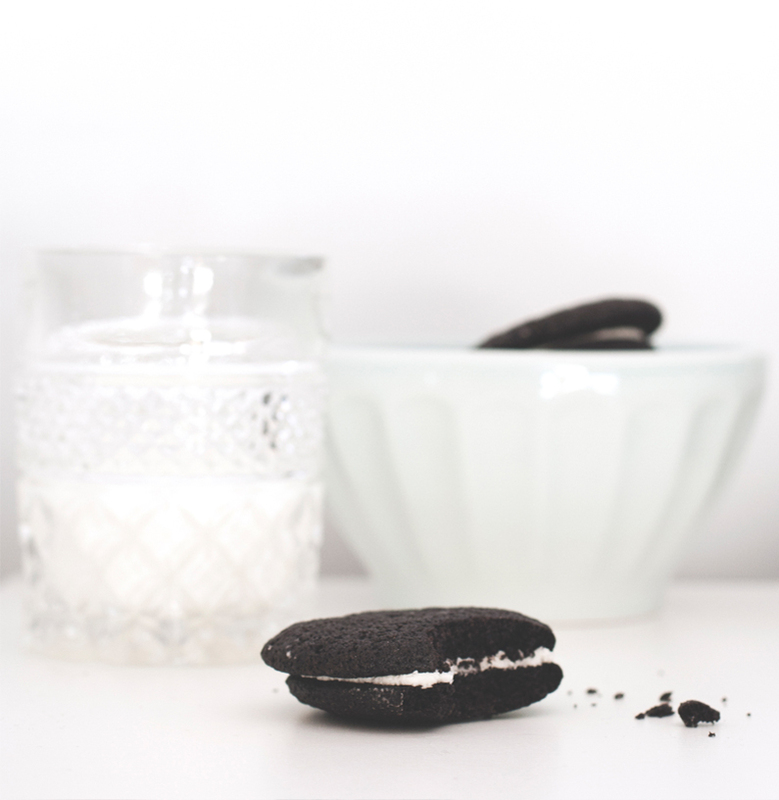 but this is no whoopee pie, it’s an Oreo cookie, and they are crunchy and slightly bitter to counter the sweet, creamy centre! I really liked the way they turned out, and urge you to try it! First, set two racks in the middle of the oven. Preheat to 375°F. 1. 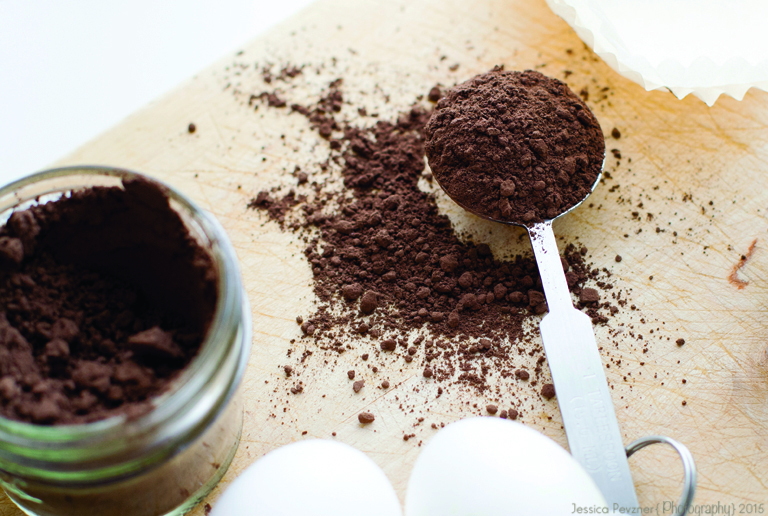 In a food processor, or bowl of an electric mixer, mix the flour, cocoa, baking soda and powder, salt, and sugar well. While pulsing, or on low speed, add the room temperature butter, and then the egg. Continue processing or mixing until dough comes together in a mass. 2. There are two ways to do this. – You can take rounded teaspoons of batter and place on a parchment paper-lined baking sheet approximately two inches apart and with moistened hands, slightly flatten the dough. – You can divide the dough into 2 pieces, wrap with plastic wrap and cool in the refrigerator at least 1 hour. Then, knead the dough slightly to help soften it and avoid cracks when rolling. Place one piece between 2 lightly floured sheets of parchment paper and roll into a ¼-inch-thick rectangle. Repeat with the other piece of dough. Using a 2 inch round cookie cutter, cut the dough into circles. Place on a parchment paper-lined baking sheet approximately 2 inches apart. Any scraps will have to be re-chilled before you can re-roll it. 3. Bake for 9 minutes, rotating once for even baking. Set baking sheets on a rack to cool. 1. Place butter and shortening in a mixing bowl, and at low speed, gradually beat in the sugar and vanilla. 2. Turn the mixer on high and beat for 2 to 3 minutes until filling is light and fluffy. 1. In a pastry bag with a 1/2 inch, round tip, pipe teaspoon-size blobs of cream into the center of one cookie. 2. Place another cookie, equal in size to the first, on top of the cream. Lightly press, to work the filling evenly to the outsides of the cookie. 3. Continue this process until all the cookies have been sandwiched with cream. **If you don’t have a pastry bag, you can easily use a zip lock bag with the corner cut off. Enjoy them with a glass of milk and share them with all your friends and family! Having been away for a few weeks it was really nice to come home to my parents place in the country and enjoy the peace and quiet these mountains have to offer. All I have wanted to do since I have been here is read this, practice my calligraphy and bake. I also got to enjoy a nice long walk yesterday. The sound of the birds and the rustling of the leaves was pretty therapeutic. This time of year is one of my favourites (even though I am a true summer girl at heart.) I absolutely love the changing of the leaves and the smell of fall. The air is crisp, the sun is still shining and yet you just want to layer up and get cozy! 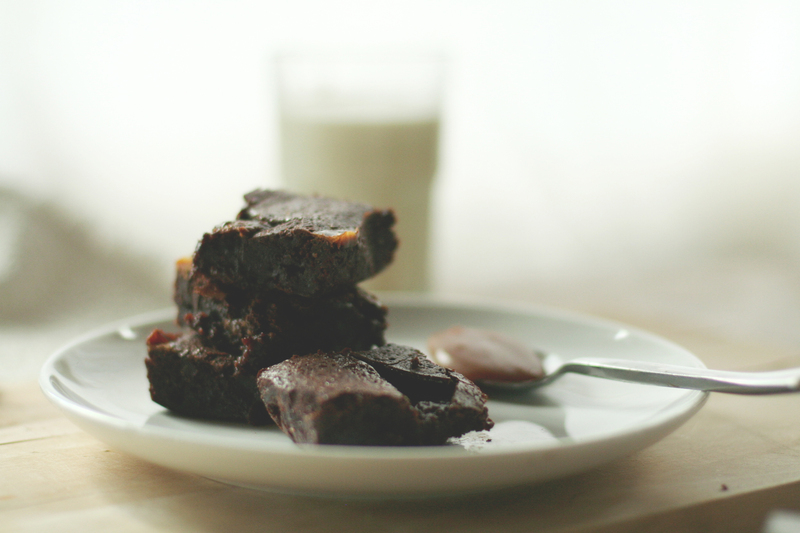 It’s the perfect balance, just like these salty sweet brownies. When I come across a recipe I love, I end up making it over and over and over again. I am kind of like that with everything to be honest. Yes, I am that person that will put her favourite song on repeat, what can I say, when I like something I can’t resist enjoying it, and this right here is one of those recipes. I have no shame, it’s so worth eating again and again…this one is a winner! The first time I came across this recipe I was beyond excited to try it, but when I saw that it required making homemade caramel, I thought “there is no way I can pull this off.” (I’ve had trouble with sugar at high temperatures in the past, let’s just leave it at that) But let me assure you, if you are feeling the way I felt, it’s really not as scary as it seems! 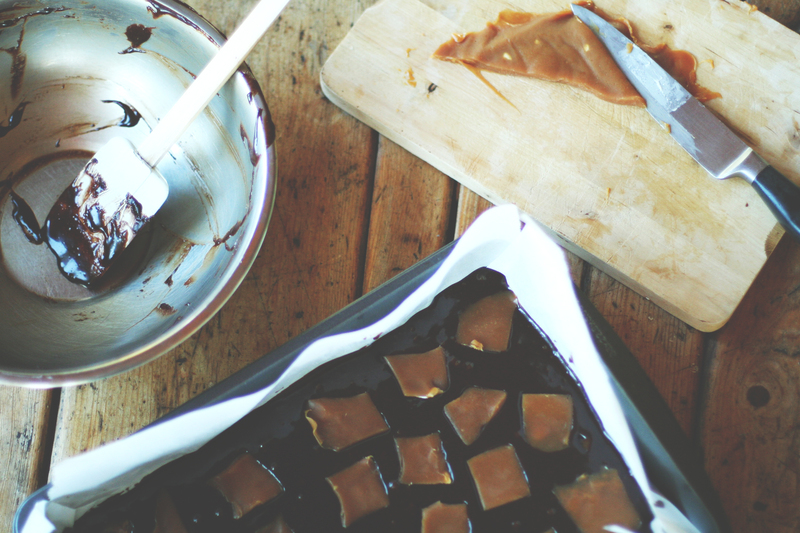 I was so happy to discover that making caramel is actually one of the easiest things to do! I really want to try making other recipes with it now! I am heading to a big family dinner and wanted to bring something sweet for everyone to enjoy. I needed something that would be a crowd pleaser and was fairly easy to transport, since this said family dinner is in Toronto. I chose this recipe for many reasons. First of all it has an awesome balance of salty and sweet and it has these ooey, gooey salty caramel surprises in almost every bite! It also uses a one bowl brownie recipe, which is awesome. I am pretty messy in the kitchen so when it can all be done in one bowl I am pretty happy about it and so is Zack. He always complains that when I cook he has to clean up a storm, but when he cooks I get away with cleaning a few dishes and then get to put my feet up (I am working on it!) For this batch I decided I would double the original recipe since it was devoured within seconds of being put on the table at the last family dinner. I am hoping that this time there will be enough for everyone to enjoy! I also discovered that this recipe can be made without flour for a gluten-free alternative. It was a happy mistake but they turned out just fine! I think I will be making these for passover this year! 2. In a medium dry saucepan melt the sugar over medium-high heat until its a deep copper colour. Stir if necessary to break up any sugar chunks that may form. (This will take about 5 minutes). Remove from heat once it has reached the desired colour and add in the butter string until incorporated. It may not entirely blend together but do your best. Now you can stir in the heavy cream and the salt and return to medium-high heat. 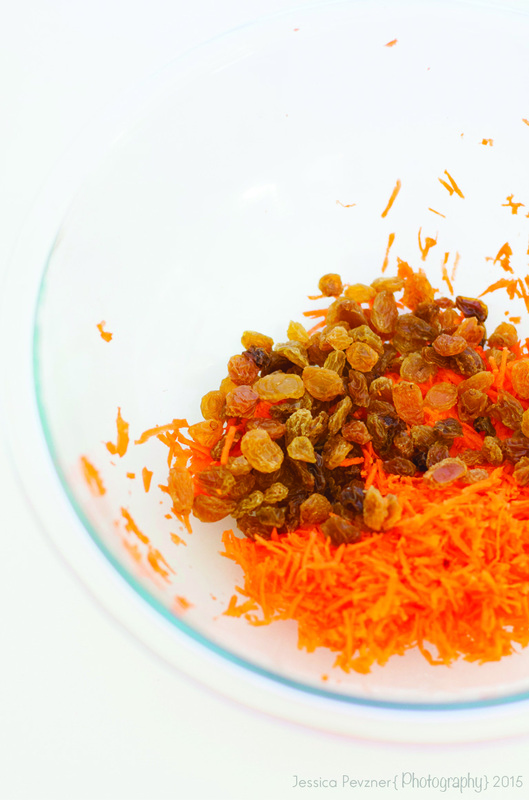 Bring the mixture back up to a simmer and melt any sugar that may have solidified. Cook the bubbling caramel for a few minutes, until it is a shade darker. 3. 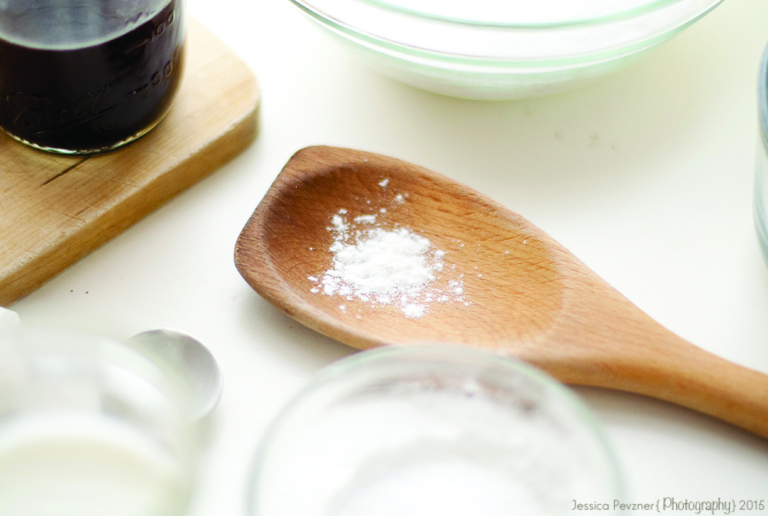 Pour the hot mixture out onto the parchment-covered plate and transfer plate to your freezer. Freeze until solidified, which can take anywhere from 20 to 30 minutes. 1. When your caramel is almost firm you can start by heating your oven to 350°F. Line an 8X8-inch square baking pan with parchment paper (in my case I used a bigger pan because I doubled the recipe), extending it up the two sides. 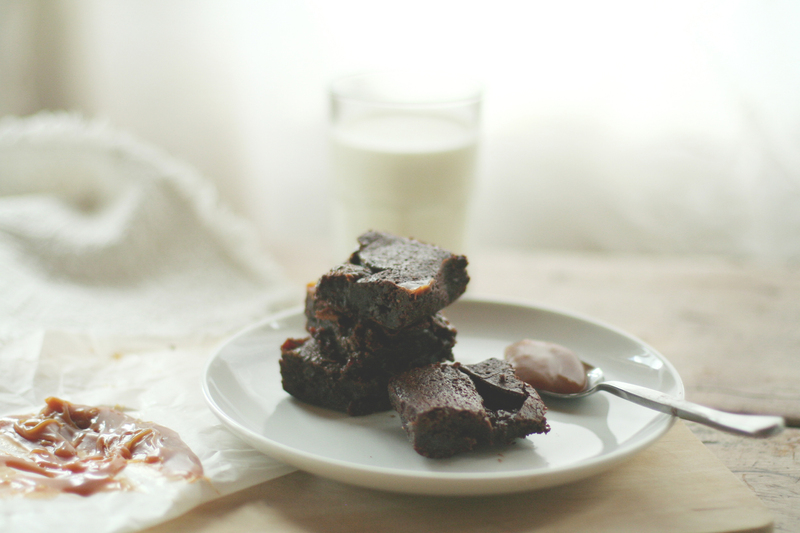 You will want to butter the paper to insure the brownies don’t stick. 2. In a medium heatproof bowl over gently simmering water, add chocolate and butter and stir until only a few butter bits remain. The chocolate will be beautiful and silky smooth. Take the mixture off the heat and stir until smooth and fully melted. You can also do this in the microwave in 30-second bursts, stirring between each. 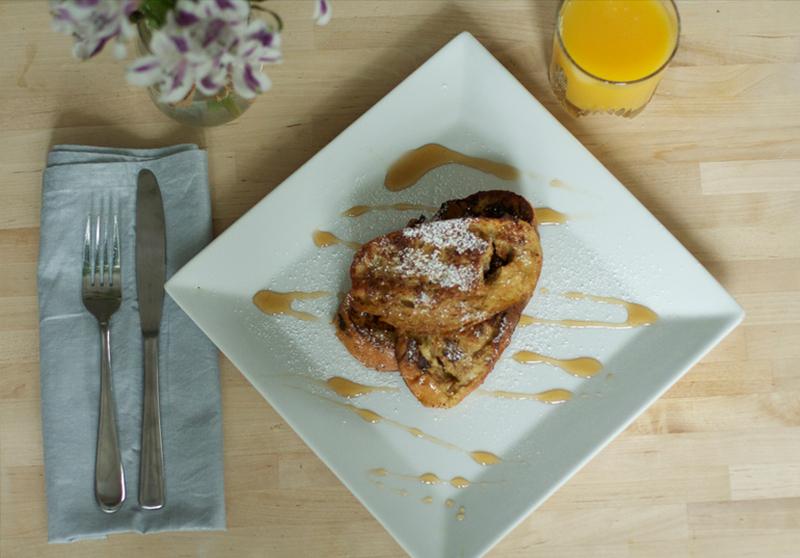 When the mixture is fully incorporated, whisk in the sugar sugar and then then eggs, one at a time. Then add the flour with a spoon or flexible spatula. 1. 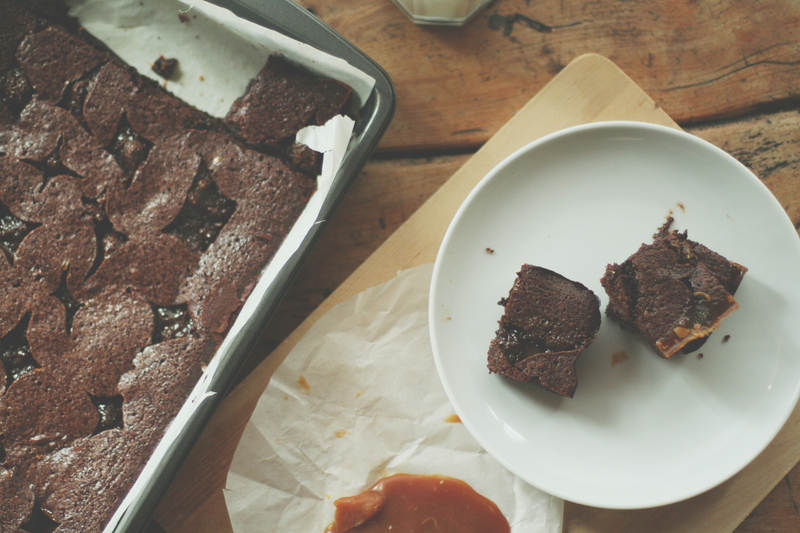 When the caramel is firm, remove it from the freezer and chop it into rough 1-inch squares. Gently fold all but a small amount of caramel bits into the batter. Scrape batter into prepared pan, spreading until mostly even. Scatter remaining caramel bits on top. Bake in heated oven for 30 minutes, until a toothpick inserted into the center comes out clean. It’s saturday morning and I have the option of sleeping in, but around 8:00 am my eyes are wide open and I am unable to go back to sleep, instead all I can think about is what can I bake? It’s a serious obsession, not only do I enjoy it but it really relaxes me. I also love baking in the mornings because the natural light is awesome in my kitchen, so my photo’s really come out beautifully without much editing. I have been experimenting with my new 50mm lens and I am having so much fun doing it! I had a bunch of ripe banana’s in my freezer because we love banana’s in my home, but they seem to go from green to brown these days, so every time a banana starts to brown and I have no intention of eating it, I throw it in the freezer. 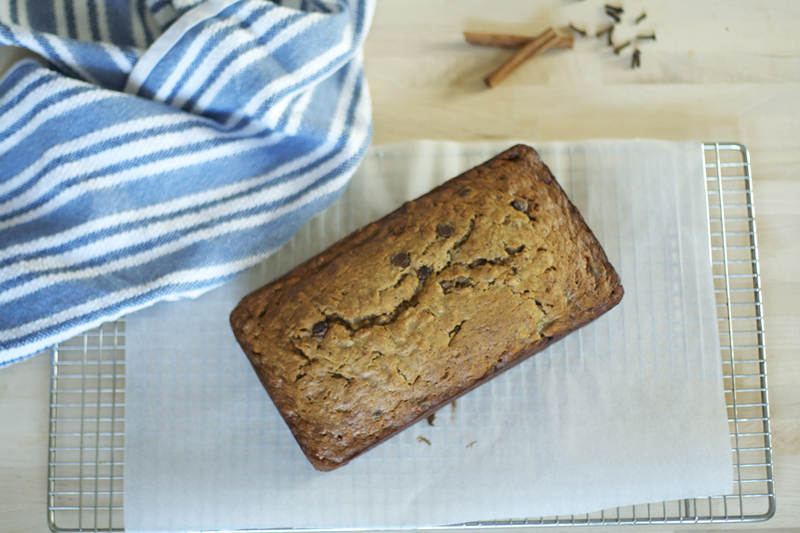 I figured, tons of ripe banana’s means only one thing: a boozy banana bread! 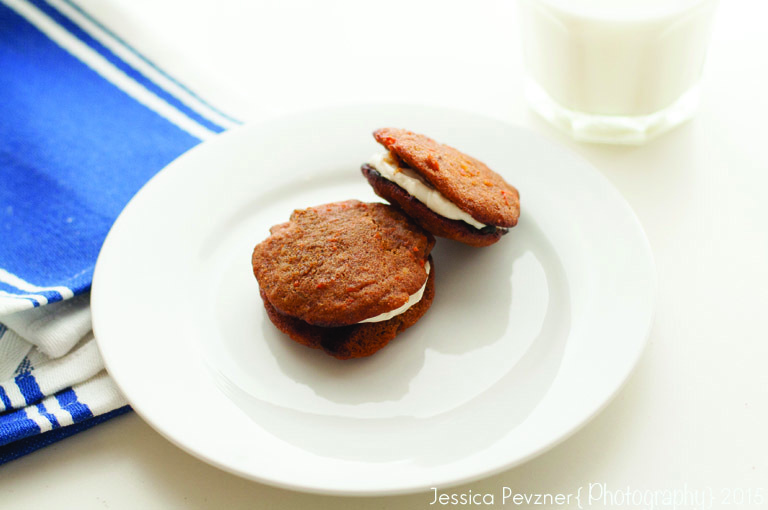 I have been making this recipe for a while now,found on Smitten Kitchen. At first I wasn’t so sure about adding the optional bourban to the mix, but I have to say it really makes a difference. The chocolate chips are also a good addition because they add that extra level of sweetness. Hello decadence! This banana bread is a family favourite and often doesn’t last more than a couple of days but since it’s so easy to make I don’t mind! Heat your oven to 350 degrees. First off, you are going to want to mash up the bananas in a large bowl and with a wooden spoon or rubber spatula add the melted butter to them. Add to that the sugar, egg, vanilla and cherry bourbon and combine. then add the spices, baking soda and salt. Add the flour and gently stir until well combined then finally stir in the chocolate chips. Pour batter into a well buttered bread pan and bake for about 45 minutes to an hour or until a knife comes out clean. Let it cool for a bit in the pan and then transfer to a cooling rack to finish off the process. I have been off work now for a couple of days over the holidays and I have thoroughly enjoyed staying home cooking and baking, working on my sewing skills, spending time with my cutie pup and my main squeeze and snapping photos. Since baking happens to be one of the most relaxing past times for me (minus the huge mess I have to clean up when all is said and done) I had to try something new over the break. Seeing as I have a rather large obsession with the delicious molasses cookies at Starbucks (Seriously I get them whenever I have the chance) I decided it was time to make my own. I found a great recipe here and got baking! This recipe makes about 36 cookies and takes about 25 minutes to prepare and then about an hour and a half to bake. They were a lot easier to make then I expected and they turned out amazing. Soft, chewy and sweet with a sugary finish. They are kind of dangerous (we have already devoured the majority of them). Preheat your oven to 350 degrees. 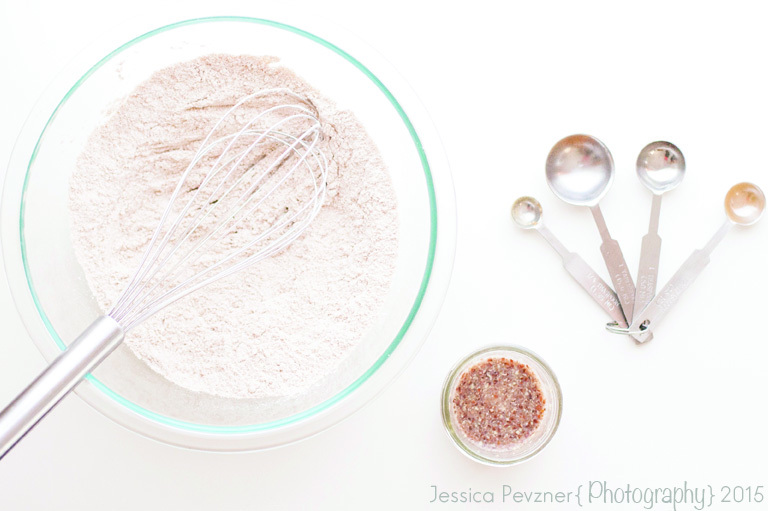 Whisk together all the dry ingredients in a medium bowl; flour, baking soda, cinnamon, nutmeg, and salt. Then set aside 1/2 cup sugar in a shallow bowl for the final step. With an electric mixer, beat the wet ingredients together; The butter and remaining 1 1/2 cups of sugar until combined. Then beat in the egg followed by the molasses until it is all well combined. Then reduce the speed to low and gradually mix in your dry ingredients, just until a dough forms. Take out about 1 tbsp of dough and roll into uniform balls. Then roll them in the reserved sugar to coat. Place the sugar coated balls on a baking sheet lined with parchment paper, making sure that they are all about 3 inches apart. 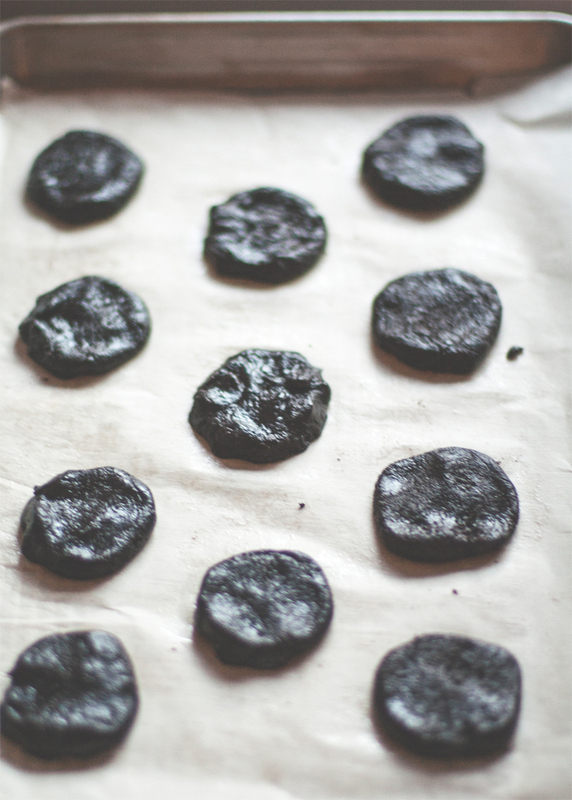 Bake the cookies one sheet at a time, until edges of cookies are just firm about 10 minutes. 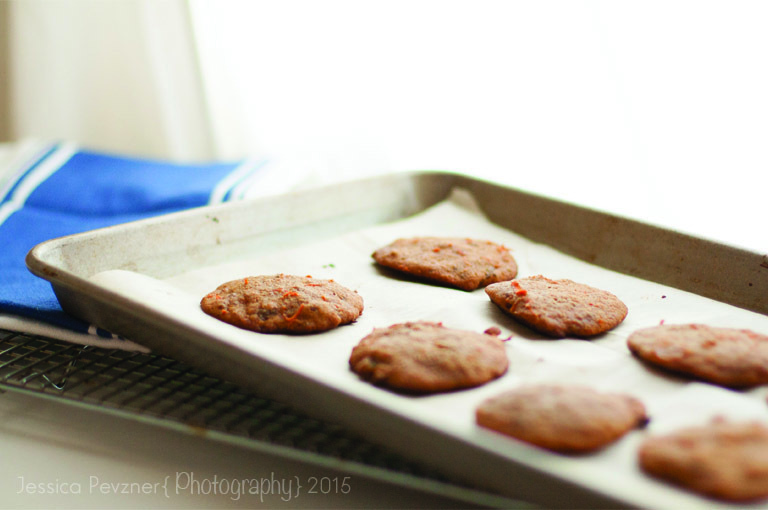 You can bake two cookie sheets at a time but they may not crackle uniformly. Cool 1 minute on baking sheets; transfer to racks to cool completely (or enjoy the hot chewy cookies straight out of the oven. ** These can be stored in an airtight container for up to 4 days! I think I will be making these on a regular basis, I just can’t get enough of their sweet, spiced, holiday flavour!